the sketch development course is comming to an end. lets conclude this with 2 mocktests. implement the skills you have learnt and do the following assignments. draw and submit mocktest 3,4 and 5 theme sketches. try to choose extreme perspective views, as that would give an instant wow effect. task 1 - draw any 3 objects used on a dining table in ants & birds eye view individually. i have sent you some assignments on basic perspective drawing. do them and submit. DAY 10 - Redo the 2d and 3d compositions. submit them by 15th April 2009 before 5 pm. if you score well oin them we will proceed to theme sketching. answer mock test 1 2d and 3d questions and submit them by 13th April 2009 before 5 pm. Ih ave picked couple of photographs you have sent, and also given direction in the mail. follow them and submit your assignment. DAY -8 . create a 3d composition using a coconut, watermelon, knife and a hammer. shade the drawing appropriately. DAY -7 visualise and create a 3d composition using a cofee mug, mouse, penstand and 2 books. shade the drawing appropriately. submit the sketch by 2nd april 2009 5 pm. Good progress in 2 d composition. lets do some exercises in 3d composition. i have sent you a series of images. study them well interms of composition, shading and object detailing. choose 2 images and replicate them as close as possible. use 6b and 8b pencils for shading where ever required to create soft shading effects. submit the drawing by 1st of Aril, 5 pm. Hope this exercise has given you insights on design principles you need to consider while doing the 2d compositions. 1. using these concepts complete TASK 2 of DAY 4. 2. create an interesting composition using squares, and circles. color them. follow design principles. if you do this task well, we will move onto the next topic - 3d composition and stilllife drawings. 3. browse through http://www.moma.org/explore/collection/index and select 2 paintings you like and explain in terms of design principles why you like it. submit the assignments by 5pm on 31st march. Task 2 - compose a 2d drawing using numbers 3, 6 and 0. use each number as many times as required , however each number should be used atleast once. write down the logic behind your composition and how you are trying to follow the design principles to create an aesthetically pleasing composition. submit the assignment by 5 in the evening of 30th MArch. for a while lets focus on 2 d composition -go through the feedback to know what all areas you need to improve upon and how. redo the assignment. this time create 3 differnet composition with 5 star and 6 asterik shapes and color them. do the coloring carefully. in general all your assignments show certain level of sghabbyness. try to avoid that by carefull attentinve coloring and drawing. submit thse 3 drawings by 27th march 5 pm. 1. for 2d assignment - compose an interesting pattern using the shapes of an asterisk and star. use atleast 5 each. color them using any 2 colors. 2. for 3 domposition - create an interesting composition using sphere, cylinder, pyramid and a cube. imagine a spot light being focused on the composition and create shades and shadows. 3. for theme sketching follow the feedback given in below 3rd image. submit the above 3 drawings by 27th evening 5 o clock. 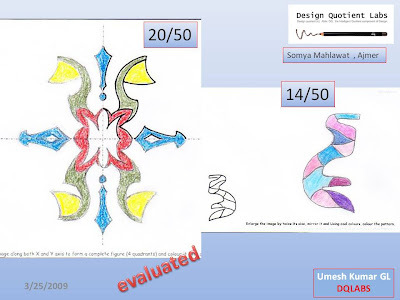 there are no freehand drawings in nata 2009. so do not worry. Somya...not bad....good hard work really shows...! !